2. “There’s an insect,In your ear,If you scratch,It won’t disappear”—U2’s ‘Staring at the Sun’ Can you say sellout? 3. “There were plants. And birds.And rocks.And things”–America’s ‘Horse With No Name’ too bad these guys didn’t have access to a random word generator back in the day. 4. “Coast to coast.L.A. to Chicago” –Sade’s ‘Smooth Operator’ oops looks like some one struggled with geography in school. 6.“He was a boy. She was a girl.Can I make it.Any more obvious?” — Avril Lavigne’s S8tr Boy Gee, I don’t know COULD you? —Shania Twain’s ‘Honey I’m Home’ Yes, but must you share with all of us? 10. “I love you like, A fat kid loves cake” —50 Cent’s ’21 Questions’ Admit it, you laughed, this would be perfect on a greeting card. I’m a little sad that this is the last free Monday on my great summer schedule, it’s not going to be fun to go back to a 5 day work week. This week kicks off the back to school craziness that happens every year, I need to gear up for long days and weekend work for the next few months. So I made the most of today, took care of several errands, cleaned the fridge, a couple loads of laundry and several hours of crafty time. I made this layout for the Journaler’s Junction Challenge, how could I not participate in a challenge that incorporated statistics. I’m in love with the glitter paper from Doodlebug, I’ve been ogling it since it made it’s way to the store a few weeks ago. I finally broke down and bought some and used it on a few projects this weekend. First this layout for my weekly sketch post for the Scrapbook Destination blog. 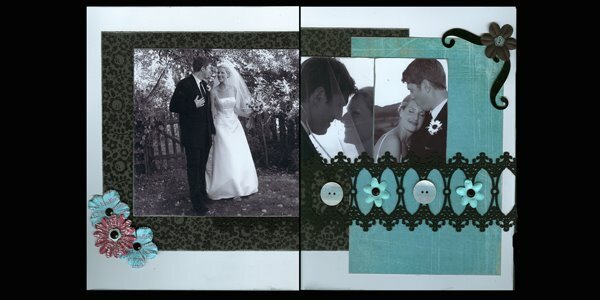 It has lots of dimension with velvet die cut strip, buttons, primas and bling…my poor scanner had a heck of a time. 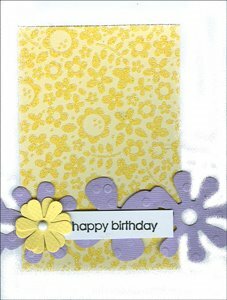 Then I made a card for my fabulous friend Becky whose birthday is tomorrow. I liked it so much I adapted the design for one of my Make and Take projects for the next SD Frenzy. ok, I know it’s not Thursday, but still pretty close. I was a little distraught after So You Think You Can Dance last night, so I wasn’t in the mood to find a video. As with every reality show, there comes a time when a favorite/the best person gets voted off. I thought perhaps David Cook winning Idol might have broken the curse. Alas, the curse continues and last night my lovely Will was voted off SYTYCD…I nearly cried. He was the best this season and dare I say ever (Yes, Heather I think he’s better than Danny). I blame myself, I never vote and I’m sure there are millions of other Me’s at home on their couches thinking a contestant is so good, there’s no way they won’t make it to the next round and inevitably they get knocked out. Note: this video is not his best in terms of showing talent, but my personal fav…how can you not love the James Brown groove. a new bloggie banner for me. Yippee!! As I said yesterday, meeting Heidi Grace was one of the highlights on the show for me. 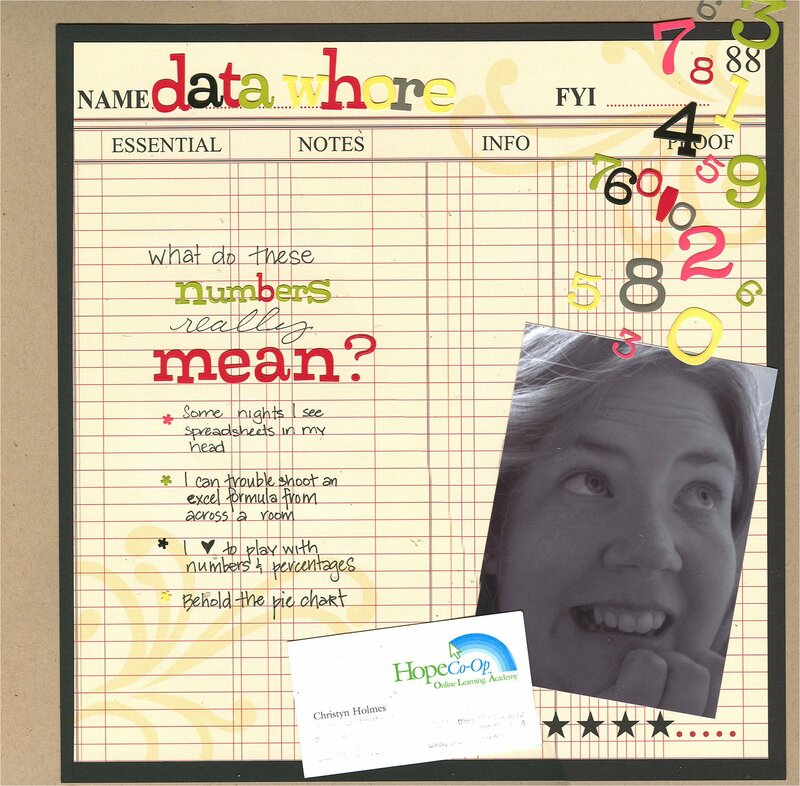 In my minute long chat I confessed that I was using an electronic version on my blog header. I think she may have thought I was a little crazy and while didn’t say no outright, she did remind me that those designs are Fiskars and they have a little department called ‘Legal’ that might not appreciate my use of the paper in quite the same way I do. So…time for a new plan. She said come back later in the day and she would draw me a personal piece to use on my blog. How cool is that? I was feeling pretty special, even if she was drawing for anyone willing to wait in line…I’m guessing mine was the cutest. Come on, look at my cute long legs and Tanner’s happy face. When our outbound flight took off on time, I thought I had broken the curse. Really what could go wrong now? Yes the plane seemed a little loud, but it was a small commuter plane so I didn’t really think too much about the noise…it’s been awhile. In hindsight, I realize it was really loud, even more so than a bush Cessna. After we were flying for a bit the noise stopped, I remember thinking at that point we must have reached the magic altitude and all was quiet and aligned for a good flight home. That’s just about when the captain came on the PA, to be honest I was not really paying attention, I thought he was saying something about flight time, weather, the glorious plains we were flying over, yada, yada, yada…then I heard ‘shut down the right engine‘ he assured us that he prepared for this in simulation lots of times, ok great no worries we’ll just keep going then the really dreaded words — we are turning around and going back to Chicago…WHAT! Why? we were due for a stop in Lincoln and we had to be a good way there already why must we go back to Chicago…not that I really wanted to be stuck in Lincoln, but visions of O’Hare sleepover were dancing in my head. This is United after all and I wasn’t expecting much in the way of customer service once we landed. Flight Attendant A did not help increase positive outlook, upon landing she said something like ‘We’ve landed safely and that’s the good thing, the crew really has no idea what will happen with you all now, but someone should meet the plan and give you further instructions…pause…good luck. ‘ Not much in the way of reassurance, I’m guessing she didn’t vote for the negotiated contract. I’m happy to report that United proved me wrong and by the time we landed, was actually prepared with a plan that didn’t involve hotels and stand-by flights . In a mere 30 minutes we were reboarding a new plane and underway. I got home about midnight and am whipped today. Despite the ending, it was a great trip…I’ll be sorting through my 200 or so photos and post more about it tom. Go figure, I head to CHA on the same weekend Denver FINALLY gets it’s own music festival with big names. Not that I’m pouting, but I’ll admit to being a little bummed to miss this great event. So, for purely selfish reasons…here’s a little Dave to get me and anyone else by until next year.